When the teams will come out to the field today, there will be a certain sense of familiarity, but the chasm will be evident. 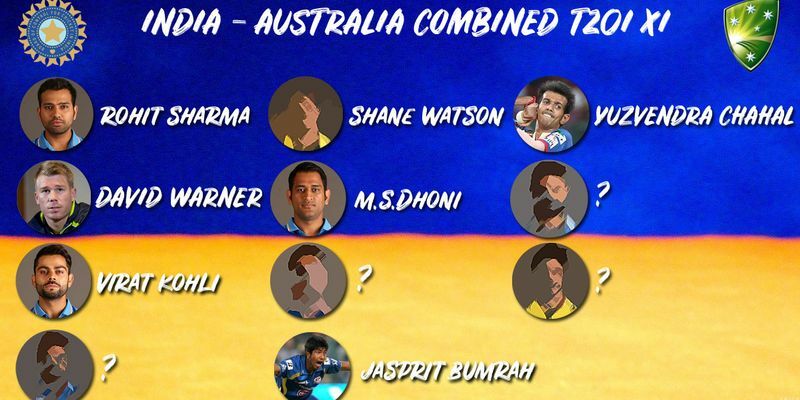 But when it is Australia, you indulge yourselves in a little revelry and we, at SportsCafe, decide to pick an All-time India-Australia combined T20I XI to get into the mood. In a format that was supposed to be Australia’s strong-point, no one has been able to explain why the team from Down Under has failed to live up to expectations, with a lot of players, either being under-achievers or total failures in due course of time. However, with India, there is a clear case of unearthing talent from every nook and cranny of the country thanks to the introduction of the IPL and so it is hardly surprising that our India-Australia All-time combined T20I XI is dominated by the players from the Asian team. Rohit Sharma: It is not at all a matter of discussion. The all-time highest run-scorer of the format has a sheer aura of audacious stroke-play that puts him ahead of many in the world. Aaron Finch has, of course, done some great things with the bat and has no less than 1663 runs at an average of 39, but he has never been able to put the opposition out of the game inside the powerplay, like the way Rohit did in Indore in 2017. The Indian vice-captain is the perfect combination of power-hitting and brazen stroke play in an orthodox manner, and his ability to successfully lead the side in the absence of Virat Kohli gives him brownie points over the current Aussie skipper. David Warner: A lot has been said and done for the sandpapergate incident, but it can't be denied that Warner is the quintessential T20 batsman and arguably Australia’s most successful as well. His assertive approach was the major reason why he has had a lot of success in the Indian Premier League. One of the few T20 superstars among Australia’s continuous mediocrity in the shortest format of the game, Warner is better suited for the role than Shikhar Dhawan or Gautam Gambhir, who has been decent at the role though and never managed to take it to the next level. That said, Warner, pretty much like Chris Gayle and AB de Villiers, brought a different sense of opening batting to T20 cricket. Virat Kohli: He has underperformed in the position, but how can you challenge him? Batting in the most succulent manner possible, the way the Indian skipper had batted in the 2016 World T20 game against Australia left people finding new adjectives to praise him and made him the world’s best all-format batsman. He doesn’t abide by the quintessential T20 ball-bashing methodology but his meticulous planning and sheer accuracy of calculation have given him a box-office appeal that no other Indian or Australian can match up to. Suresh Raina: A star in the IPL, and equally successful for India in the shortest format of the game, it is a shame that Suresh Raina is not being counted as one of the finest T20 players of all-time. To go with his superb T20 batting pedigree, his diving efforts in the ring, the filler overs in a run defence contributed to the making of Raina - the World Cup winner. What goes awry in the middle and why he couldn’t keep his position for the long haul is a matter of intense case study, but still when you pit him against the likes of Yuvraj Singh, Cameron White and Glenn Maxwell, one thing was clear that no one has done it like MS Dhoni’s most-trusted ally in the IPL and beyond. Raina would make it to the XI without any fuss. Shane Watson: In the context of this selection, no one - I repeat, no one - comes close to challenging the sport’s one of the vexing figures. Shane Watson has always been disturbed by the common perception, and the regular occurrence of stress fractures, hamstring strains, calf problems, hip complaints, and dislocated shoulders forced him to short cut his red ball career, but that helped him gain a cult status as a T20 batsman. His ability to strike clean against the pacers and spinners alike brought a different meaning to the middle-over batting in T20 cricket. His exploits in the 2012 World Cup was very hard to ignore and despite Yuvraj playing some good knocks for India from that position, Watson will be much ahead in the pecking order. MS Dhoni: From leading the team to the inaugural World T20 title to bringing them close on two more occasions, T20 format loved MS Dhoni the captain too much. However, only in a Utopian world will a man walk in with only bouquets sans the bricks, and in reality, it is always different. A format that was designed for his brand of cricket, Dhoni’s T20 career never took off, but in the world of mediocre wicket-keepers at the international level, Dhoni commanded a different level of respect. A batting average of close to 38, Dhoni’s biggest contribution to this team is the amount of level-headedness he brings to the table and how good he has been behind the stumps. Hardik Pandya: While this can’t be said with certainty that Hardik Pandya is a good T20 all-rounder or not, he is certainly better than Ravichandran Ashwin thanks to his adaptation with the bat that Ashwin could never achieve. Xavier Doherty and James Faulkner were certainly two options, but they have never been able to take the game away from oppositions’ grasp like Pandya, thus making the Indian a better option than them. The Baroda all-rounder has been a partnership breaker and often doubled up as a third seamer in the team. With his fielding, he has made himself a version of Andre Russell and will add more value to this set-up. Yuzvendra Chahal: Yes, you read it right. I am picking him ahead of Ravindra Jadeja and Ravichandran Ashwin. In a couple of years that Chahal has operated at the highest level, one thing is clear from his bowling that he is fearless, the first attribute one must have to be a T20 cricketer. His bowling average of 19.93 is the best for an Indian bowler and that speaks volume about Chahal’s importance to the squad. With his mixed up leg-spin, Chahal made sure that picking wickets are the primary job of a spinner, which has so refreshing to see from an Indian. Kuldeep Yadav: Again the same logic goes for Kuldeep. IPL might have provided us Ravichandran Ashwin, but if one player epitomizes the attacking instinct of a spinner, then it has to be the left-arm wrist-spinner. Coming through the ranks in the IPL, Kuldeep ushered in a new era of spin bowling that has hardly been the norm by any other spinner in both the countries. Adam Zampa, for all the promise, has never come close to what Kuldeep has achieved in his short international career so far. Bringing him into the team adds more balance and give Chahal a chance to operate with his favourite partner. Jasprit Bumrah: Zaheer operated for a while in T20Is, with Bhuvneshwar Kumar and Irfan Pathan causing a considerable amount of problems to the oppositions, but none has been more threatening as Jasprit Bumrah is. The Gujarat pacer’s high-arm action, which gives him heavy release strength, makes him a perfect T20 bowler for all weather conditions. Apart from the number of wickets taken or terrific spells bowled, Bumrah endurance to go through the rigmarole and not lose the rhythm makes him a consistent performer for Team India. Mitchell Johnson: For everyone, who is thinking we have the team largely skewed in favour of the Indian team, here is Mitchell Johnson. Australia might have underperformed in the format, largely due to their bowler’s failure to adapt to the shortest version of the game, but Johnson has been a standout performer for the country. With 38 wickets from 30 matches at an average of a shade over 20, Johnson has a clear case of being the best pacer in the country, although James Faulkner has a better average and picked up more wickets. His bowling in the powerplay and the death overs was bound to concede more runs than any bowler who was bowling through the middle overs.